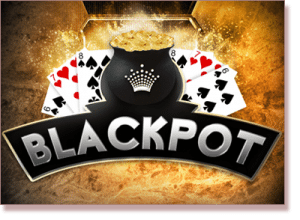 Blackpot is a widely popular progressive blackjack side bet which started out as a local speciality at Crown Casino in Melbourne, Australia. With humble beginnings as a trial side bet available on only 12 blackjack tables, the lucky black pot proved a big hit with gamblers and eventually moved to over 60 tables within a month. The reason for Blackpot’s popularity is its generous offering of bonus winnings for players willing to have a little fun on a side bet. With the ability to place a Blackpot bet alongside your hand, or on someone else’s hand, and the chance at scoring a healthy jackpot, Blackpot is a fun variation to mix up the typical game once in a while. The cards can be in any order and any suit. Our first card could be a Seven of Spades, and the second could a be Six of Hearts, for example. The minimum bet and maximum payouts for a Blackpot bet can vary from table to table, but the minimum bet will never be less than $1. If our first two cards dealt are any of the three above combinations, we are paid 10 times our initial Blackpot wager: $1 would be paid out at $10 immediately; a $2.5 bet would be rewarded with $25. Our original Blackpot bet still remains in the Blackpot box. From here, the player in control of the hand can choose to stand and take no more cards, and thus the Blackpot side-bet end and the dealer collects the initial wager placed in the Blackpot betting area (we have already been paid our winnings). However, if we choose to hit, our original Blackpot wager continues, with a chance to win a whole lot more. This is where the fun really begins, and some extra luck is very, very welcome. If you are in control of the current hand, you should always opt to hit to take full advantage of the side bet. If you are not in control of the hand, the decision to hit/stand is not up to you, but the hand’s total will be no more than 15, so a hit is many cases would be ideal. 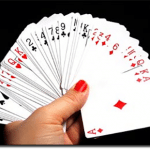 If the hit is called for, then if the third card dealt completes the three-card combination of a Six, Seven and Eight (any order, any suit), this will give the hand a total of 21, and the Blackpot wager will be instantly paid out at 100 to 1 of the initial side-bet amount. However, if you don’t score that lucky combination, the original Blackpot wager is collected by the dealer and the fun ends there. If the three-card combination was achieved, our Blackpot bet ‘rides’ to (remains in place for) the next hand, with the chance at an even larger bonus now up for grabs (this is what is meant by a two hand progressive game). Of course, this only occurs if the previous hand completed the coveted Six, Seven and Eight card combo. 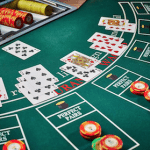 Assuming that combination was completed and the next hand is played, just like the first deal, if the first two cards dealt are any combination of those same three numbers (six, seven and eight), our Blackpot wager is immediately paid out at a 1000 times our initial wager. If the minimum amount of $1 was placed, say hello to a cool $1000. While the controlling player again has the choice to stand, like in previous hands, it would really be absurd to do so. The next potential win is too great to let slip by. Take a moment to let this sink in: if you choose to hit and once again, the 6-7-8 combination is completed, the Blackpot bet is paid out at 20,000 to 1! (up to the maximum payout). For a side-bet, that is a substantial win. Of course, the odds aren’t exactly in our favour. Blackpot is a side bet we like to call dumb fun. It’s got a flexible minimum of $1, and the fact we can place a Blackpot side wager on another player’s hand without sitting down, is good if we don’t feel like playing our own hand. While the odds of getting the coveted 6-7-8 combo over two consecutive hands to win the cool $20,000 bonus is slim to none, Blackpot is definitely entertaining and less of a wasteful side bet than some other counterparts.